An HDMI Splitter is used to take a single source (such as a BlueRay Player, Cable Box, or Satellite box) and distribute that HDMI signal to multiple TVs. Most splitters if needed can also be cascaded to further expand such splitting capability. The use of a higher-grade cable when using a splitter is highly recommended due to the added resistence of connecting your devices through multiple ports. A splitter should not be confused with an HDMI SWITCH (which is used to connect multiple HDMI source devices to a single TV). The most common splitter is a "1:2" - or "one to two". The most common use for such splitter is to attach to a cable or satellite box, and split (or distribute) such signal to 2 TVs located in different locations. All of today's modern splitters support most of the HDMI version 1.4A specifications. Splitters can NOT support ARC (audio return channel) and HEC (HDMI over Ethernet) as the properties of these features require that the source device be dedicated to a single TV. Splitters can generally be used up to 50ft from the splitter location to the TV providing that high-quality HDMI cables are used. A maximum distance of 25ft from the source device to the splitter is recommended. Longer distance from the splitter to a TV can be obtained using our REDMERE HDMI Cables orFiber Optic HDMI Cables. An HDMI cable is attached to the source device's (such as a cable box) OUTPUT port and the other end to the splitter's INPUT port. HDMI cables are then attached to each of the splitter's OUTPUT ports to each of the TV's. Normally, a general duty 28AWG cable could be used for shorter distances. However, our FLEX EXTREME cables are recommended when using HDMI splitters to minimize resistence. The use of splitters does have some caveats. If the resolution capability on one (or more) of the TVs being split to is different (for example, if one TV supports 1080P, and the other only 720P), the splitter must drop the split resolution to that lower resolution. Both TVs (while powered on) will thus drop to 720P. However, if the lower resolution TV is powered off, the splitter will re-scan the destination displays and support the original higher resolution ignoring the powered off TV. Signal converters (such as HDMI to VGA or HDMI to Component Video) may not properly work when with a splitter. The splitter attempts to perform a "handshake" looking back at the source device (such as a BlueRay player), and ahead to all destination devices (such as your TVs). When a converter is introduced after the splitter en-route to the TV, the splitter on MOST OCCASSIONS can not successfully determine the proposed resolution and signal type that the converter is programmed to output. Certain splitters will however successfully work with certain converters, but we have not been able to find a definitive combination of such products that will always work properly together. A splitter can NOT be used in reverse. If you have multiple HDMI devices that you are trying to connect and your TV is short an HDMI INPUT port, use a SWITCHinstead. If you are using a splitter to send a signal to a 3D TV, and then are trying to send the OTHER signal to a receiver (to capture AUDIO), the 3D signal MAY not be supported. The splitter (using HDCP digital content protection rules) first completes a "handshake" to each of the destination devices to determine what resolution and features are being used. This handshake information is then sent back to the splitter to determine what resolution - and if a 3D image can be split successfully. 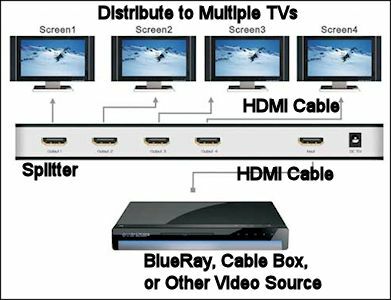 If you are splitting a 3D signal to TWO TVs, and one of the powered on TVs does NOT support 3D (or the 3D capability is of a different technology), the splitter again must automatically drop the 3D capability and provide a signal that is supported by both powered on TVs. This is not a splitter design deficiency - but an electronic property of the HDCP (copy protection) rules that all splitters must adhere to. Support for concurrent TV usage - meaning both TVs can be on at the same time without violating HDCP rules, or content licenses providing that signal is being split into the same house-hold, or same business location. All TVs are not required to be powered on at the same time, however. 3D Support - provided BOTH display devices being split to BOTH support 3D and the 3D technology is of similar type (ie passive vs active). If ONE (or more) of the displays does NOT support 3D signally, such display (or receiver) can be powered off and 3D capability will be restored to the remaining TV. You may have to power cycle the splitter to achieve this.